An idea I’ve been kicking around for a couple of years became a formal book project in January. 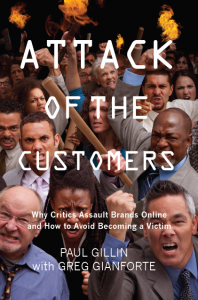 Eleven months later, Attack of the Customers is now available! I’d like to ask for your support by liking the book on the Amazon page and registering your like on the book’s Facebook page. And if you can go the extra mile and plunk down $13.50, I think you’ll find it a pretty interesting read (use discount code at right). In some ways, this book is an update of my first book, The New Influencers, which was published more than five years ago. One of the things that has always captivated me about social media is the power it gives to individuals to greatly amplify their voice. Several of the case studies in New Influencers involved customer attacks in the days when blogs were about all people had to work with. Today, attacks take many different forms and involve many different tools, but the pattern is the same: People have learned that they can get better results from rallying friends and supporters to their cause than by going through established customer service or complaint channels. Most customer attacks don’t go viral, but they can be effective even without big numbers. Just last week a woman who claimed she had been victimized in a contract dispute with a big Canadian retailer took her cause to YouTube and Facebook. With YouTube views averaging about 25,000 per day, her story caught the eye of mainstream media, which is usually the turning point at which things happen. One thing I discovered in writing the book is that mainstream media attention is essential to helping a cause go viral. Newspapers and magazines may be suffering financially right now, but they’re just as important as they always have been to validate and spread information. One reason customer attacks have become so numerous in recent years is because businesses and government agencies have historically had such miserable customer service. Support organizations were outsourced en masse in the 1990s, customer service agents were hidden beneath layers of confusing call routing menus and complaints routinely disappeared into black holes. Big organizations often didn’t respond to complaints because they didn’t have to. Customers had no easy way to share their frustrations, so there was little concern that a product or service deficiency would become a problem. Goodbye to all that, and good riddance. Customers now complain so fluidly that the problem for many businesses is figuring out which gripes to take seriously. In the final chapter of Attack of the Customers, my co-author Greg Gianforte presents a formula he calls “Eight to Great.” It’s a list of eight steps companies can take to become customer-focused at the core, and it’s been applied by thousands of companies during Greg’s term as founder and CEO of RightNow Technologies. His advice really comes down to the Golden Rule: Treat others the way you would like to be treated. The trouble is that the payoff of good customer satisfaction is a lot harder to measure than the benefit of a dime saved in production. We make the case that companies have no choice but to invest in this area, though. In the age of the empowered customer, service is one of the few points of differentiation left. This is the first of my five books that I’ve self-published. We used Amazon CreateSpace and hired professional design and copy editing resources, but much of the work between the covers was done with Microsoft Word. I even created the index myself to see what the experience was like (although I don’t think I’ll try that again). Many authors are experimenting with self-publishing now because the commissions on commercially published works are so small that book-writing becomes a $10/hour proposition. Social networks are also sufficiently mature that good word-of-mouth can potentially replace traditional marketing. Whether that’s true or not I expect to find out in the coming months. I certainly could use your help. Whether it’s a like, a review or a credit card, anything you can do to express your support is gratefully appreciated. And if you’re a blogger or editor who would like a review copy, just leave a comment here or drop me a line and I’ll be pleased to send you one. This entry was posted in book, influence, mainstream media, New Influencers, Social Media, social networks and tagged Attack of the Customers, crisis communications, customer service by Paul. Bookmark the permalink. done, done and done (waiting for kindle version). thanks for bringing needed strategic attention to how companies relate to customers. it feels like this movement could create two very positive economic outcomes: 1) increase salaries for people with great customer service and problem solving skills, and 2) increased number of jobs as the phone-menus are ripped out. do you know of anyone building quantitative models that predict those impacts? Unfortunately, I know of no one planning to rip out phone menus, not to mention what the economic impact would be. Businesses in general continue to pay scant attention to customer service, despite the fact that America’s most admired companies these days are typically those that do the best at delighting their customers. “Most admired” = market share growth in markets with any kind of competitive landscape where entrepreneurs or responsive organizations can quickly take share using customer service orientation. Someday soon there will be a phd thesis built on the monitoring of twitter sentiment correlated to share price volatility and a report on the industries that are most affected by social. Prediction – cable and phone will not be affected. mobile / consumer electronics / auto most affected. Thanks so much for your support, Kent!